The Champion Power Equipment 76533 3800 Watt Dual Fuel RV Ready Portable Generator with Electric Start operates off GAS or PROPANE straight out of the box (propane hose included). On gasoline the generator will produce 4750 starting watts and 3800 running watts, and on propane 4275 starting watts and 3420 running watts. The generator also comes with a battery for easy Touch Start: push-button electric start which includes an internal battery charger that charges the batter as the generator runs. It makes a great addition to your RV as well as a cost effective and convenient solution for power outages or other emergency situations. – Dual Fuel – Runs on GAS or PROPANE straight out of the box. – Safety Fuel Selector Switch. – Gasoline Fuel Tank and Propane Inlet. – Gasoline Fuel Tank – 3.4 Gallon (12.9 L). – Touch Start – Battery included for push-button electric start. – Portable – Folding handle with never-flat tires. – Runs up to 9 hrs. on a full tank of gas. – Noise level – 68 dBA from 23 ft.
– 50 State Compliant (EPA/CARB certified). 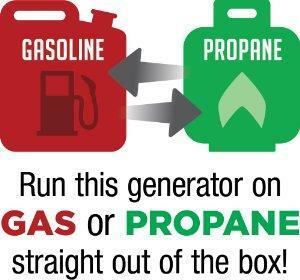 This generator can run on either Gas or Propane; the choice is yours. 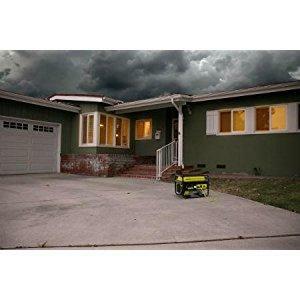 The Champion 76533 Dual Fuel Portable Generator features push-button electric start. The battery for this operation is included.